HOLLYWOOD — More than 200 Native American athletes representing about 30 Tribes from 12 states made their yearly trek to Hollywood for the 10th annual Randall Huggins Memorial Big Ballers basketball tournament, held Dec. 5-7. One of the largest Native American tournaments in the country, it is known for its hospitality and attractive prizes. Organized by Trail Liaison Norman Huggins, his wife, Kathy, and their children Marilyn, Kelvin, Adriana, Bianca, Kailyn and Lucas, the tournament gets high marks from those who travel great distances to attend. Teams from colder climates also appreciate the subtropical location of the tournament. 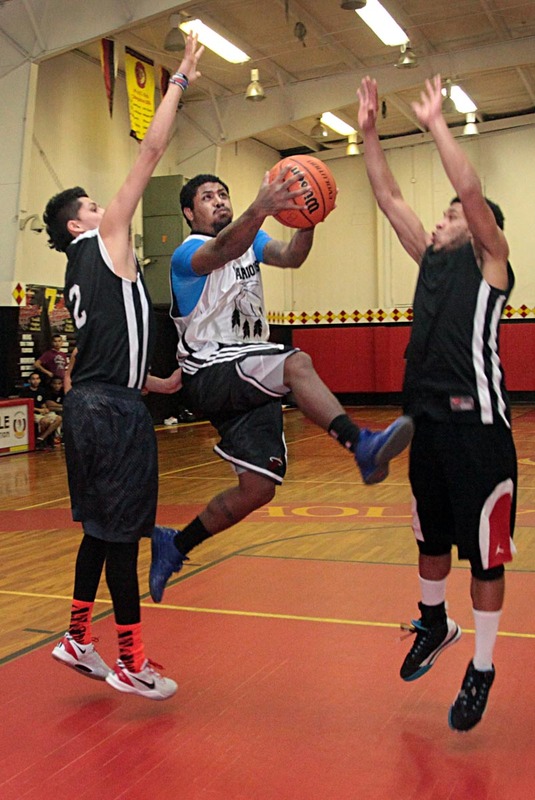 The tournament began as a way to remember Randall Huggins, who passed away at 21 during a boxing match, and to bring Tribes together, Kelvin Huggins said. The family promotes the event through Facebook and other tournaments in Indian Country, but mostly through word of mouth. Twenty-six teams competed, 14 men’s and 12 women’s. Each team had a roster of eight, but many were accompanied by family members, so the crowds in the Hollywood Gym were large and vocal. After three days of competition on the court, the tournament came to an end with two victorious teams. Lady Ballers, comprised of players from Florida, Mississippi and Oklahoma, took the women’s title. LOP (Lords of the Plains), comprised of players from Oklahoma, won the men’s tournament. Throughout the tournament, the gym was full and the Hollywood Reservation teemed with activity. Iona’s Fry Bread, from Trail, set up a tent and served food; another food tent was set up on the outside basketball court for the players. Families and friends from all over Indian Country took time to get reacquainted with each other. In the early years of the Big Ballers tournament, Norman Huggins looked at how other tournaments operated and incorporated those practices into his own. But he also went further and runs it as professionally as possible, which includes having three officials on the court instead of the standard two. “We don’t want them to miss a call,” he said. He said he recognizes how much work and organization go into producing the tournament and appreciates the help of the Hollywood Recreation Department. “I want to thank the Hollywood community for letting us come in and disrupt things,” he said.